What exactly are the achievements of Priyanka Gandhi Vadra? And how is having ‘resemblance to Indira Gandhi’ a qualification? Priyanka Vadra, wife of Robert Vadra, the accused fraudster, and serial land grabber, straightaway becomes General Secretary of India's oldest political party, without any past contributions, without any credible qualification, without any struggle, just because she is a Dynast. And our feeding-on-crumbs media is dancing, wagging their tail. On a piece of news that was neither unexpected nor unanticipated, many shameless senior journalists also couldn't contain their excitement. The entire obsequious media cabal were celebrating the formal entry of Priyanka Vadra, someone who co-owns Congress Party, into politics, as though she has some proven past record as a political strategist. Shameful conduct. I would love to know what Priyanka Vadra’s personal and political achievements are. None to my knowledge, but I would appreciate if someone educates me on this. The most fitting description, as someone pointed out on Twitter, which we have also witnessed earlier is, that Priyanka is nothing more than Rahul Gandhi in a long sleeve blouse and a Handloom Saree. 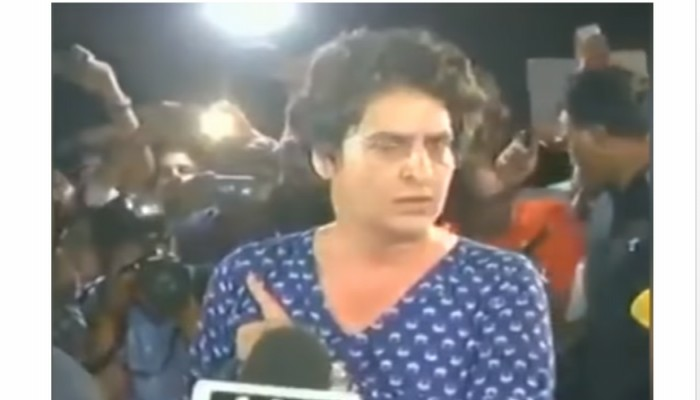 See the below video to know how the mainstream media is fawning praise over Priyanka by playing the song "Hawa Hawaii." Not media, but slaves behave like this. The media also is pitching how closely Priyanka resembles Indira Gandhi, trying to project that she is the true descendant of her grandmother and how she can be the Congress Party savior. Indira Gandhi will be remembered for Pakistan's bifurcation, of course. She will also be remembered for the Emergency, for nationalizing our banks and institutionalizing corruption and capsizing Indian economy, for nepotism, for rewriting the constitution, for getting funding from KGB, for abrogating 'One Rank One Pension Scheme. I would also like to know how ‘resemblance to Indira Gandhi’ is a qualification. The Congress party under Indira Gandhi got all copies of The Economist confiscated at the Indian airports because it had published this cartoon of Indira Gandhi, in which she looked utterly ugly. Source: The Economist. “Priyanka is so charismatic, so pretty, her slim figure, flawless skin tone... she looks so classy, resembles Indira... BJP must worry now!" is how our mainstream media pitches her. The same darbari media exclaimed: "HOW SEXIST!!" This is just a trailer. Every innocuous comment will be twisted and the Darbari media will campaign the misogyny card. Just listen to the Minister what he said, and evaluate yourself how on earth is it sexist. But when Rahul Gandhi, speaking at a kisan rally in Jaipur said, "Janta ki adaalat se 56-inch ki chaati wala chowkidaar bhaag gaya. Aur ek mahila se kehta hai sitharaman ji aap meri raksha kijiye, main apni raksha nahi kar paunga, aap meri raksha kijiye." Forget the misogyny, the irony of the statement was that he called an accomplished defense minister of the largest democracy a weak person. Yet, he gets a free pass. Another brutal fact in Priyanka's formal entry into Congress is, that it is an absolute acknowledgment, which the whole country also knows, that Rahul Gandhi has been an abject failure. It also is evident that Rahul may want to restrict her role in the party, as he, in front of media, equated her with Jyotiraditya Scindhia. We have known that in past Rahul has restricted her entry into the Party. So bringing her in now shows Congress's utter desperation after no sign of any alliance with any regional party seems to be working. Rahul, as on date, for the regional parties, is like a fly in the milk. The almost euphoric reaction of the media and the Congress cadres at the political plunge of Priyanka Vadra is based on their absurd assumption that Indian electorates are fools and idiots who have still not outgrown the Nehru-Gandhi fixation despite their many misdeeds. These Congress cronies going ga ga over Priyanka's political plunge, must realize that the Vadra overhang is massive. Priyanka Vadra will now have to come out in open and declare whether she knows about and approves of the various dubious dealings of her husband Robert Vadra. But trust the Lutyens media to play her a martyr for something fundamentally nepotistic and corrupt. Remember the movie PEEPLI LIVE, and how the unknown hamlet becomes the favorite hunting ground for the voyeuristic news channels, hungry for TRPs? That was an ugly reality of our mainstream media. The state of our media today is even uglier. In fact, There’s no journalism, there are no media, not even opinions. There’s only pure, full-fledged propaganda and advocacy here. Here I am sharing something pukeworthy. This info was shared by one Twitter user (@OkieTataBye). This guy was traveling to Prayagraj and thought of visiting Anand Bhavan but ended up seeing something more interesting, and he recorded this tamasha. Check this twitter thread yourself to believe yourself. Media, over-playing Priyanka becoming General Secretary of Congress Party is a kind of absurdity that depicts how low our media has stooped and become an open cheerleader for the Gandhi family, like slaves! Now we have to see if three Gandhis, with a free Vadra is better than two Gandhis.